It seems as though every time you see a celebrity in a magazine they are wearing a pair of suede ankle boots from Isabel Marant (which we love). But in the US recently there have been a lot of comments from the fashion pack on how scruffy and stained these boots are looking. Unsuprising – especially if you live in London or New York. 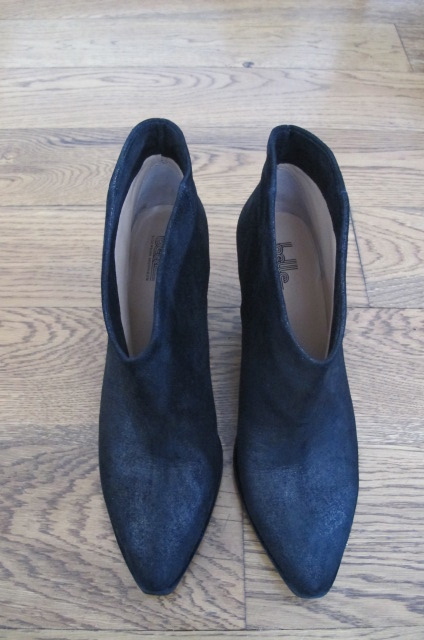 So as winter approaches and after endless window shopping in New York we decided on a pair of black suede boots from Belle by Sigerson Morrison from their great store in Nolita. Even though we chose a black pair of boots, the problem remains the same. How do we protect our boots through the winter months? The first thing to do is to protect the suede. This way you provide a layer of protection to stop the rain, mud, red wine (!) and anything else that may come your way from ruining the suede. Once the damage is done, it is (in most cases) too late. The best way to protect the suede is with a scotchguard spray. We recommend Scotchguard Water Repellent Shoe Protector which we buy from Amazon to make sure we get the right one. You don’t want to use furniture scotchguard and ruin your boots before you start. When you start to spray your shoes make sure you do this outside as the fumes are quite toxic. Just spray a fine mist over the shoes and wait to dry which will take a few minutes. Easy. Our new boots are now protected and ready to go. Now we just need to protect the sole. Looks like later today we will be off to the cobbler with our black vibram soles and then these boots really will be made for walking.